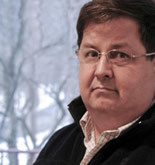 This article is a short form introduction to a PowerPoint presentation published on Slideshare.com. 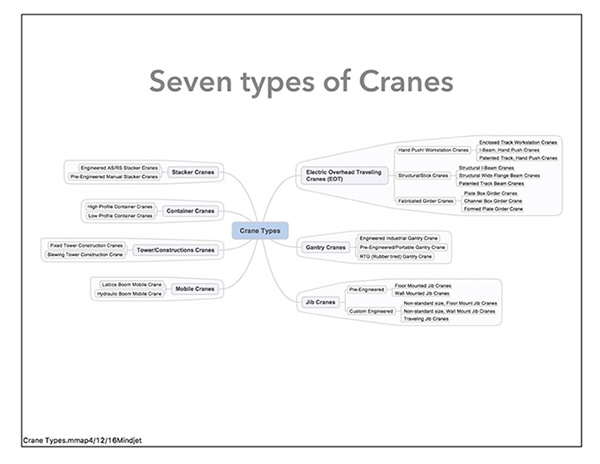 The full presentation includes charts, mind maps, line drawings and photographs to help in the identification of the various types of cranes referenced in this introduction. The link address is at the end of the document. The universe of cranes can be reduced to seven groups. Each of this seven major categories have several sub-categories. Using the proper vocabulary is especially hard in determining crane types. Like any industry, there is the proper nomenclature and then there's the slang the equipment has acquired over the years from the operator's. Electric Overhead Traveling Cranes can also be called EOT Cranes, Overhead Crane, Bridge Crane, and Overhead Bridge Crane. The term Engineered Gantry Cranes is usually reserved for the larger capacity and big ticket engineered cranes. Portable Gantry Cranes are the pre-engineered, "off the shelf" catalog products. RTG Gantry Cranes are the large rubber tired gantry cranes primarily used in shipping facilities. All jib cranes can be grouped in three types. Wall mounted jib cranes are a bit of a misnomer. They are actually mounted to vertical columns due the reaction loadings. Floor mounted jib cranes although mounted on the floor, are almost always anchored to an engineered footing. Lastly are wall traveling jib cranes, which as the name implies are attached to the exterior vertical surface and traverse the length of the building. These are very expensive and therefore equally rare. These are rubber tired, over the road cranes. Mobile cranes can be divided into two main groups with countless sub-groups, Lattice Boom and Hydraulic Boom. These are the cranes commonly seen in larger cities, used to build new buildings. Tower/Construction cranes are also divided into two families, Fixed Tower Construction Cranes and Slewing Tower Construction Cranes. These cranes are primarily used in two applications, 1) multi-modal transport facilities and 2) maritime container ports. To a much lesser extent, they are also used at industrial faculties to handle large fabrications such as tank fabrication facilities. Stacker Cranes also come in primarily two varieties, 1) manual, pre-engineered, storage systems and 2) engineered AS/RS storage and retrieval stacker cranes.